I’m currently working on a front-end project that uses both React JS and Angular JS. Yes, that sounds a bit crazy but the project is evolving from Angular to React, and this is the difficult transition phase. We are using $ngRedux to manage our Redux application state, which presented an issue to me today when I created a new React component in this AngularJS dominated codebase. We can discuss $translate another day. So my React component uses Redux, and thus I use the very useful connect() function to transform some useful stuff from the store to my component, like actions and props. Invariant Violation: Could not find "store" in either the context or props of "Connect(MyReactComponent)". Either wrap the root component in a <Provider>, or explicitly pass "store" as a prop to "Connect(MyReactComponent)". connect() expects a prop called store in the component. This prop is the redux store which provides the data and the dispatcher to the component. However, we’re using $ngRedux via dependency injection. I searched around the redux codebase, issues, and docs to see if I can change the expected prop name. I was unsuccessful. It doesn’t mean it’s not possible, it’s probably my lack of ability to find it (which you could argue means a lack of concise documentation). (If you’re new to compose/flowRight, it’s just a simple way to layer HoCs for a component). There we have it! It feels heavy handed, and perhaps I should try and raise an issue with react-redux to allow a prop name change. But this gets the job done and I hope it serves someone well. For my mum’s business, I run the website simplyfleece.co.uk. It has been through various incarnations but right now, it’s a simple website which I wrote in pure HTML and CSS (shocking!). Originally, when deploying to IBM Cloud, I was using Node JS and Express to serve the HTML. But this is overkill, especially when using Cloud Foundry. IBM Cloud still allows users to deploy cloud applications with CloudFoundry, which I use for all of my applications. Normally I would use the NodeJS buildpack, but for simple HTML and CSS, I only need the Static Buildpack which allows simple HTML files to be served with very little config! Simply create your website, and then create a Staticfile file, and push to IBM Cloud, and it’s ready to go! 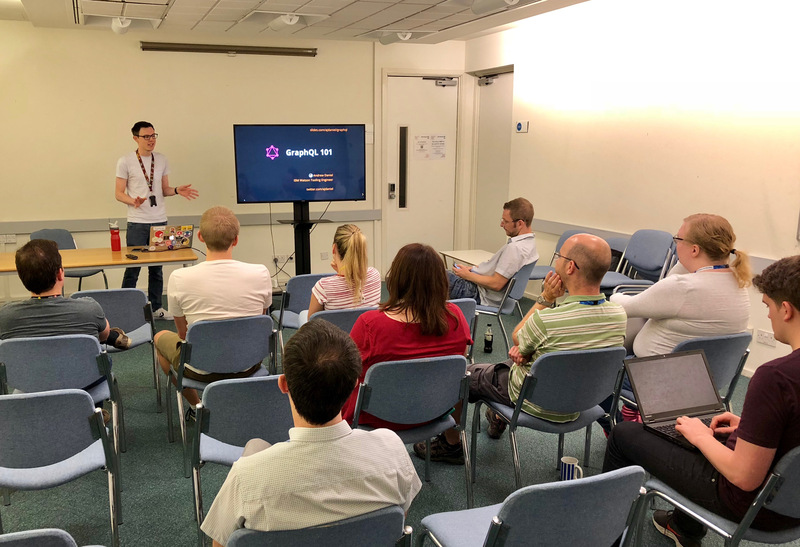 Today in IBM Hursley I gave a quick introduction to GraphQL. We are using GraphQL in my current project at IBM Watson, with good success. While we as a team are still learning how to best use it, I can at least attest for its benefits compared to REST. REST is not without issues, baked into its design. By describing only how to seek and modify data, servers and clients can be tightly coupled, which means it can be difficult to apply change to the API without causing a lot of work to update the client. Another issue with REST is predicting what a client will request. Designing an API usually means designing how the client will need and utilise the data. If the client strays off the beaten path, it can result in underfetching an overfetching, meaning requiring additional API calls for more data, and discarding useless fields in payloads. GraphQL aims to beat these issues, and more. By describing your data structures in a strongly typed schema, you define, and implement with resolvers, only the data itself. This means you aren’t enforcing a way of fetching data on your client, only providing whatever the client asks for. The client then queries the graph of data, fetching all and only what it needs, saving time and bandwidth, in a single payload. For more information, I recommend the GraphQL website and How to GraphQL. Alternatively, read my slides that follow. I’ve created a whole new blog on my Github Pages site! Here it is!